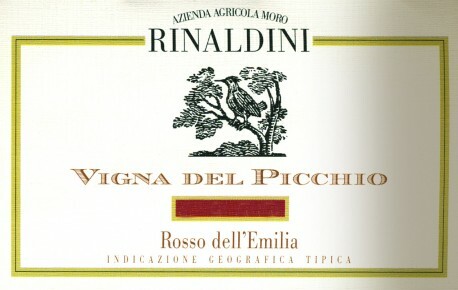 ‘Vigna del Picchio’, or ‘Vineyard of the Woodpecker’, is the winery’s most prestigious bottling, the result of a challenge to create a still lambrusco of elegance and character. Made with Lambrusco Maestri and Ancellotta grapes that are carefully selected and harvested late, the wine undergoes long fermentation and then is aged in barrique for 15 months. Intense ruby red in color with violet flecks. Elegant and intense aromas of sweet red fruits, prunes, cassis, caramel and toasted coffee beans on the nose. Velvety tannins on the palate, well balanced, with a good finish. Pairs well with salami, coldcuts and cheeses (especially parmigiano reggiano), hearty meat dishes and is also a wonderful meditation wine. Late harvest of over-ripe grapes and fermentation “in rosso” on the skins at controlled temperatures with submerged cap for at least 1 month. Aged slowing in barriques for 15 months. 33% in new oak, 33% 1 year, 33% 2 years, then in old oak for 18 months, finally resting in bottle to obtain balance and structure.